← Slow Moving White Colored Oval Shaped Object. 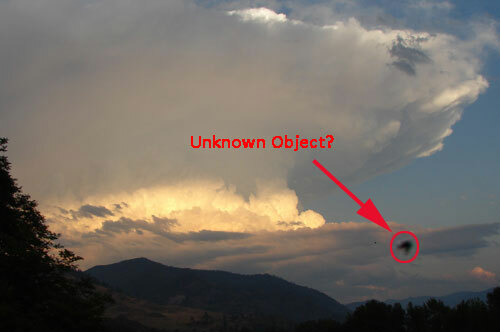 Photo of Unknown Object Near Thunderstorm. Description: On another occasion I took pictures of thunder clouds after a thunder storm, and captured an anomalous object. I didn’t see the object when I took the picture, and didn’t notice it until I loaded the images into my computer. The picture was taken above the Clark Fork river. Note: This witness has had a number of sightings where he has “signaled” unknown aerial craft and found that the craft exhibited a response. Comments Received February 12, 2011: It’s clearly a bird. The camera was obviously set to infinity focus since the distant mountains & scenery are in focus. The object is nearer the camera & out of focus, but certainly looks like a bird. This entry was posted in Montana UFO Sightings Prior to 2013, UFO Photos Montana. Bookmark the permalink.